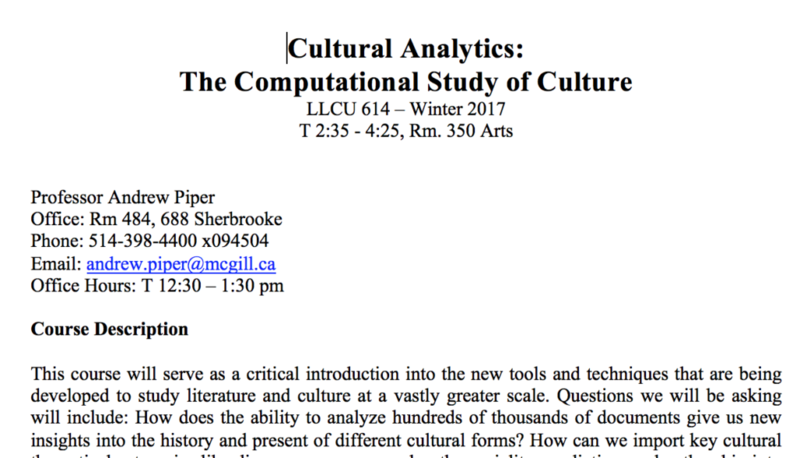 I am pleased to add this year’s syllabus for my graduate course, “LLCU 614, Cultural Analytics: The Computational Study of Culture.” The aim of the course is twofold: 1) to introduce students in the humanities to the computational and quantitative methods for studying culture in order to move beyond the use of anecdotal evidence and 2) to introduce students in computer science to the importance of theory for studying culture, i.e. to avoid a naive approach to data analysis. As I mention in my opening class, this course is about valuing different ways of looking at cultural questions and also conceding major methodological flaws in our current disciplinary orientations. Everyone in the room has something valuable to add given their disciplinary training and everyone also brings essential blind spots to the study of culture, including myself. This course is about making us all more sophisticated cultural analysts. Is Open Science a Neo-Liberal Tool? Here’s why not.